It was a great experience and the ring is wonderful! 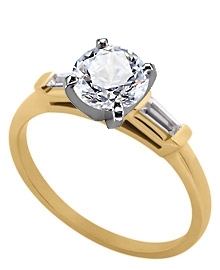 "This is a classic 3.2 mm engagement ring with baguette side stones. The ring is set with 2 channel set baguette diamonds, each approximately .10 ca rats with a color of G-H and an average clarity of SI. 1 diamond is channel set on each shoulder of the ring for a total weight of 1/5 carats.